Your bed and bath linens, as well as departure cleaning are provided with your stay. 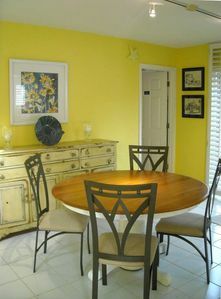 This spacious duplex, offers 4 bedrooms and 3.5 baths, and has plenty of space for 10 guests. 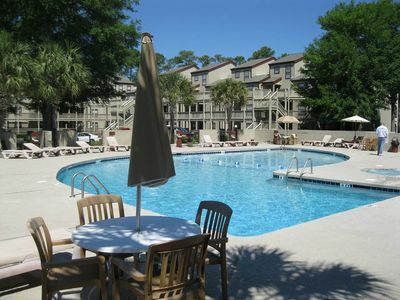 It has free WI-FI, flat screen TV's , DVD players and all the comforts of home. 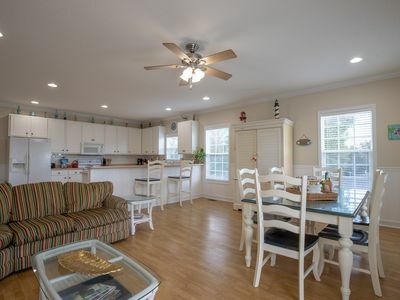 It is nicely decorated and only a short walk to the beach. 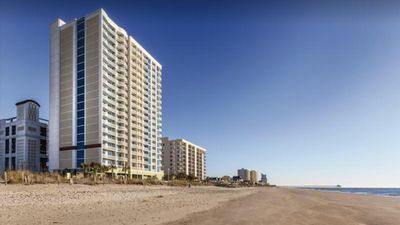 It is priced right and ready for your next vacation! 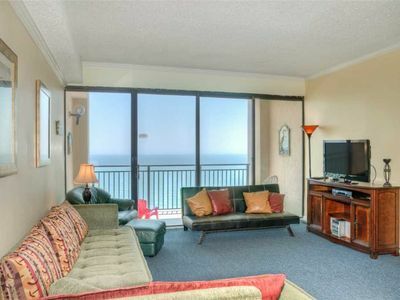 LIVING ROOM: Sectional sofa seats 7; flat screen TV, access to the balcony and a peak of the ocean. 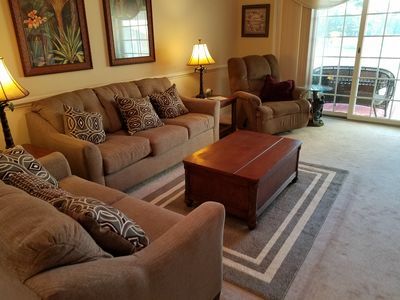 Queen sofa sleeper; Convenient Half Bath in the hallway,off the family room. 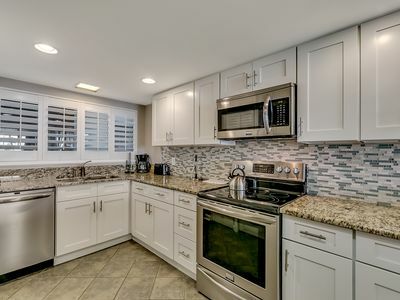 KITCHEN: Tiled floors; All full-sized appliances, small appliances, microwave, blender, coffee pot, mixer, etc. Plenty of dishware, pots & pans, crock pot. 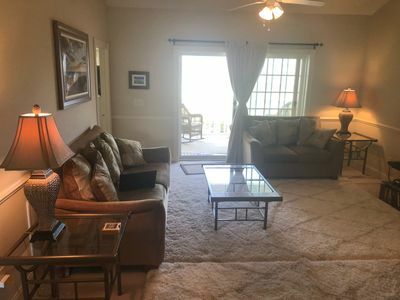 MASTER BEDROOM: Located on the 1st floor; 1 King bed (can be split into 2 twins), flat screen TV, ceiling fan, private full bath with separate soaking tub and glass enclosure shower and double vanity sinks. 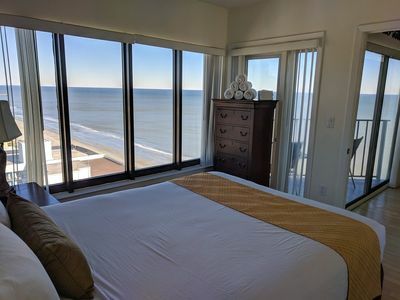 MINI-MASTER BEDROOM 2: located upstairs 2nd floor; 1 king bed , flat screen TV, ceiling fan, Private bathroom with glass shower enclosure and double sinks, walkout balcony with ocean peek views. GUEST BEDROOM: located upstairs 2nd floor; 1 king (can be split into 2 twins) , flat screen TV, ceiling fan, shares the Jack-N-Jill bathroom with the Queen bed guest room. GUEST BEDROOM: located upstairs 2nd floor; 1 Queen bed, flat screen TV, ceiling fan, shares Jack-N-Jill bath with the king bedroom. 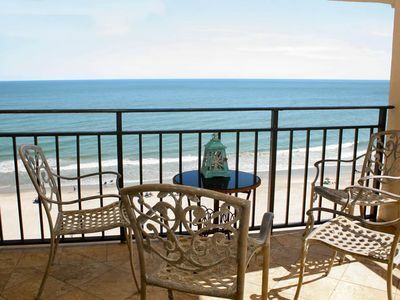 OUTDOORS: 2 furnished balconies with access from the master bedroom and living room. An outdoor, enclosed shower is perfect for washing the sand and sea off. Grilling area is located just away from the covered parking. 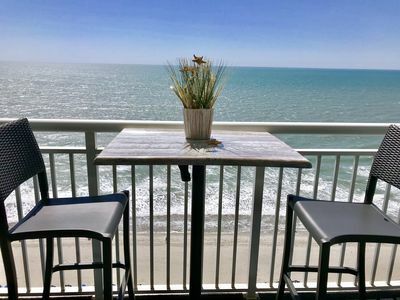 The owner shares the beach provisions of chairs, boogies boards and sand toys. 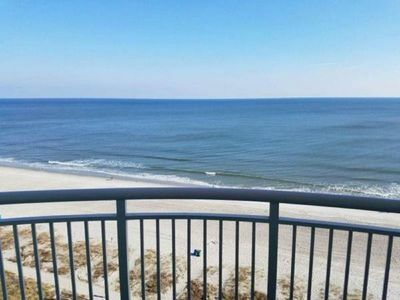 LOCATION: The beach is a short walk from this condo (3 blocks). Or rent a Golf Cart to make trips to the beach a breeze!! 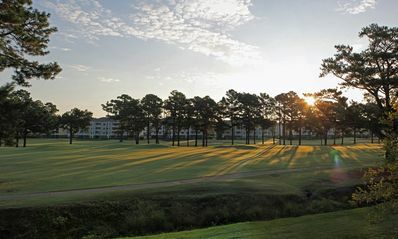 This is a non-bike friendly property but golf carts are very welcome. 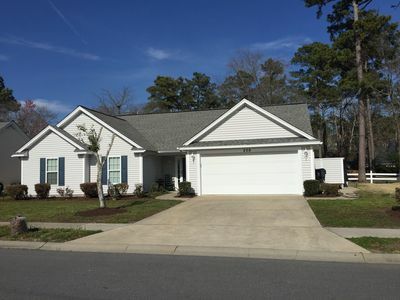 Nearby is Barefoot Landing with over 60+, specialty shops, beach stores, restaurants and entertainment attractions for the whole family to enjoy. Stroll thru this beautifully landscaped complex, and shop for jewelry, clothing, accessories, beach items, sweet treats and don't miss the black market mineral shoppe, specializing in real gemstone jewels, and inexpensive rocks and collectible stones. The Alabama Theater offers live first rate theater productions every day of the week (in season), with talent nothing short of Broadway! The Carolina Opry, and Pirates Voyage, also have great family oriented shows. Windy Hill Beach is an expanse of white sand & blue surf, with free public parking, and new rest room facilities. 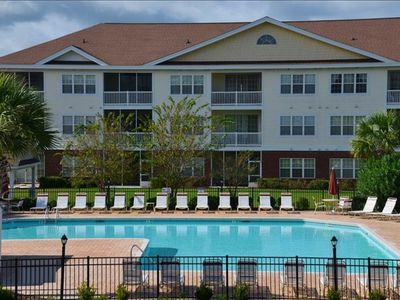 Nearby Barefoot Landing shops and restaurants offer something for everyone, and you will spend many nights strolling through this beautiful complex. 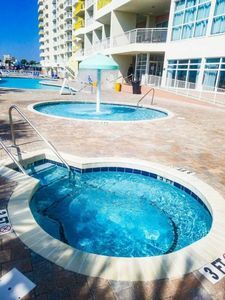 Beach stores, ice cream shops, handbag and accessory shops, live music and theater, toy stores and specialty shops, you name it, its all a few blocks from this great vacation property. 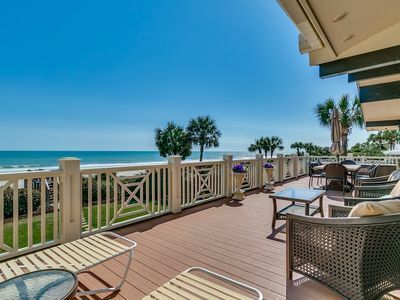 We know you will not be disappointed in this lovely unit; it really is "A Bit of Paradise". 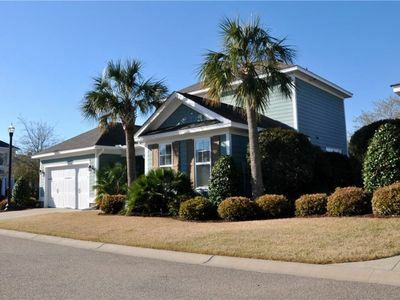 Beautiful Beach House, one floor, wifi, golf cart, 3bedrooms,2baths.gas grill. Gorgeous! 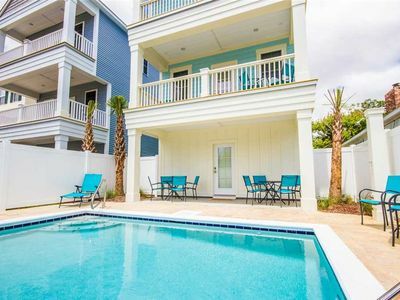 5 Bedroom 4.5 Bath Beach Home w/ Pool ~ Hot Tub ~ Game Room ~ Balcony! 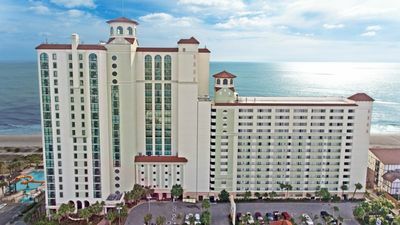 Visit breathtaking Towers on the Grove Resort! 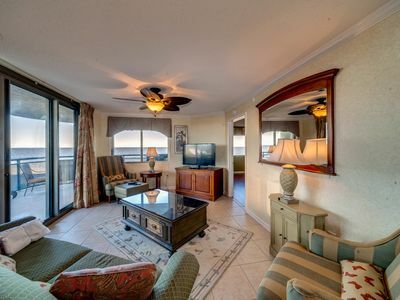 Atlantica 2BR 2BA excellent oceanviews sleeps 8 ! !